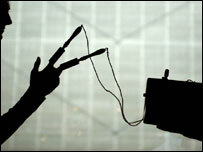 Weird and wonderful inventions will be on show during a debate on medical "quackery" at London's Science Museum. Devices once used to treat the sick are being taken out of storage for the adults-only event on Wednesday evening. Many date from the 1800s. 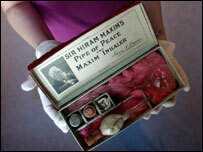 They include Sir Hiram Maxim's Pipe of Peace, a precursor of the inhaler, and a hand-cranked electric shock machine used to treat toothache and tics. The debate will take place at the museum's Dana Centre from 1900 BST. Lisa Jamieson, head of Dana Centre programmes, said: "This will be a unique chance for our audience to discuss their views on complementary medicines with leading experts in the UK today and to find out more about the stories behind the Science Museum's unique medical collection. "We know this topic is important to our audience and this series of events at the Dana Centre will allow them to get to the heart of the debate." The debate will ask whether so-called quacks really offer an alternative form of treatment or just peddle useless drugs to the foolish. A museum spokesman said: "Much of the medicine of the past looks like quackery today, yet at the time it was accepted by the best doctors of the day - and it seemed to work. "Certain theories and practices have moved from quackery to orthodoxy to quackery again. "Using images and objects from the Science Museum, this event asks how do we spot a quack, do the quacks of the past look like the quacks of the present and how do we know what works and why?" The debate will be presented by Dr Patrick Wallis, of the London School of Economics.